“[See Water is] the positivity of reggae with the intensity of punk rock,” Patrick Farrell eloquently stated and immediately, everyone at the table gave him their undivided attention. It was one of the few times he had spoken during the crisp afternoon when he effortlessly laid down the concise description everyone else was trying to reach. Of course, his band mates Sam Roberts, Riley Randall and J.R. Spencer were quick to hound on him after acknowledging his feat, a recurring pattern throughout the conversation. It became clear that the chemistry between the four was the result of a dynamic balance, not only within their music as Patrick suggested but their personalities. The four rebound off one another, providing different qualities to strongly express what another person doesn’t, just how a band needs talented musicians on a variety of instruments. J.R. obviously brings the troublesome fun; after all, who throws chicken wings and proceeds to get everyone into a fistfight? He also seems to have a talent of falling asleep wherever he pleases, and apparently turning on the dryer is the best way to drown out his snoring. As mentioned before, Patrick is reserved and articulate (that’s why he writes the emails) but also elusive, with an air of mystery apparently being that of hot air balloons. Riley is as laid back as all the other guys but has an insightful confidence, which explains why he writes the lyrics. Last but not least, Sam seems to be the uniting factor with his own witty sense of humor and light-hearted attitude. When surrounded by their company, it feels as if they’ve been friends for years, which made it difficult to believe the band had actually originated beforehand. Beginning as an acoustic duo with only Riley Randall and Sam Roberts, See Water was thought of whenever they were still in high school in Washington, D.C. While they expanded into a full band during their time up north, graduating left them in diverging paths. Yet the two best friends remained relatively close as Riley went to Coastal Carolina and Sam enrolled at College of Charleston. Upon Riley’s decision to leave traditional education behind, he also ended up in the historic city and See Water was revived and renewed shortly after. After the addition of Patrick and J.R., they’ve been thriving here ever since. Around town, they have consistent gigs at local bars and restaurants such as Beerworks on Tuesday nights. They host their own monthly event, Crosstown Throwdown, which is essentially a potluck open to everyone and features a variety of local musicians. Earlier this month, the band won 1770 Record’s Battle of the Genres and later performed in Barnet Courtyard per the college record label with Big Yen, serenading college students in the cold afternoon. As the guys are just getting started back up again, all the attention is definitely a major encouragement. Just within the past month or so, they’ve had a logo designed by local artist Kyle Victory and recorded a new single at Battleground Studios. 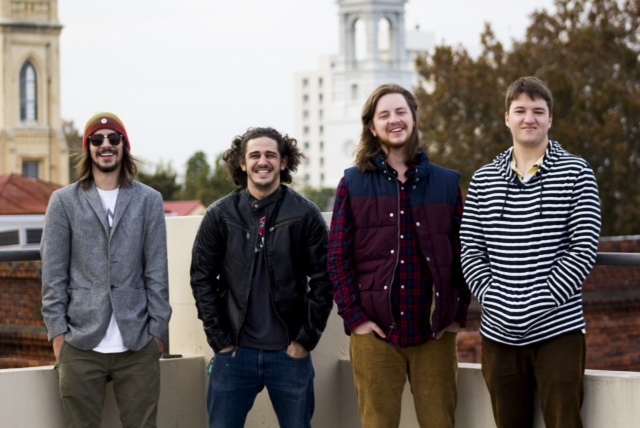 Yet the biggest highlight is their upcoming show at the Music Farm’s Chucktown Gets Down. This is the second time the venue has put on the event, designed to showcase not only local musicians but also local artists and craftsmen. See Water will be sharing the night with Tom Mackell, Mado Smith and the Phantoms, the Dunder Chiefs, and Bizness Suit, all while vendors will be set up inside the Farm selling anything from handmade skateboards to jewelry. The boys will also be contributing to the merchandise with their recently printed t-shirts and copies of their last recorded single “Fox Trap” (which they will actually be debuting that night and the copies will be free). As if the debut of a new single isn’t enough, you can expect nearly all of their material that night to be new – the boys agreed the set list only has a total of four old songs. While a lack of money has kept them from recording a full-length album yet, it’s evident they have enough material and speculate having something released next year. As another step in that direction, the Battle of the Genre’s grand prize was the chance to record a single at Ocean Industries. So even if the album is far off, at least that can be expected shortly. They just have to finally decide between recording “I Wanna Go Home” or “Soul Song” (maybe they’ll perform both at the Farm and the audience can make a choice for them). Against all of the hype of booking live shows and recording, Sam emphasized that all he hopes for is that people have a good time. He explained that being on stage is the best feeling to him; even if he gets nervous before nearly every show. He spoke for the entire group whenever he said their desire is just to move people and make the night fun. J.R. may have also mentioned that they’re also in it for babes, but I’ll give him the benefit of a doubt and say that comes second. Purchase tickets to Chucktown Gets Down here.